One of the biggest secrets about being an organised person is that it takes time. I’ve already posted a little about how I spend my organising time in “How to Use a Planner to Get Organised” and in “Prepping for the Month Ahead” I outlined how I set up my planning ‘foundation’ for the coming month. Today, I’m sharing my process for my weekly planning session. My Sunday Sessions are probably the most time intensive, but also (I think!) the most important for making sure the week ahead goes smoothly. First things first I do a review of the week that just passed. If you’re using DIYfish inserts, there is already a section there for you to do this, if you’re using Life is Crafted, Arienne has a monthly review area you can use, but just a plain sheet of paper will be fine too! What you choose to focus on in your week review is completely up to you, it might be financial goals or fitness goals – whatever you like. This process gives me an opportunity to reflect on the week that passed, and take stock of my strengths and weaknesses, as well as celebrate the fun moments or things that made me feel happy. That sounds really ‘new-agey’ but setting intentions is a great way to acknowledge what you want to achieve in the week ahead. Before I even step into my daily pages, I use my DIYfish weekly overview page to map out the week. I break each day into 5 sections. I have 2 main reasons for using this section. Balance: I want to make sure I have a good balance over the week. That I’m not overwhelmed with work, that we’re eating well, and that our activities are focusing on each of areas that Juniper needs to build on (Fine motor, Gross motor, Memory & Listening). Flexibility: This is just an overview and is not set in stone. This plan often changes as my week evolves. For example: I might switch up the meals if Luke’s roster changes or drop an activity if we stay out late one day and don’t get back in time. So often I don’t add them all into my daily pages until I have a better idea of what’s happening. Often I add a little flair to my pages with positive quotes and stickers, but the most important thing for me to add at the start of the week is Luke’s Roster, and my project deadlines – everything else in our days is flexible and may change. Luke’s work hours are indicated with the green line.. I block out the hours he will be gone. The red dot means that I have a deadline that day – the details of which will be added to my work to-do list on the 2nd page. I also add in any immovable items like time specific appointments, social gatherings or visitors, and then I build up my ‘flexible’ daily items around them, and that includes things like my blog posts or Juniper’s daily activities. Before I finish my weekly session, I cross reference against my DIYfish monthly and weekly inserts to make sure I haven’t overlooked anything important. Then I’m set for the week! 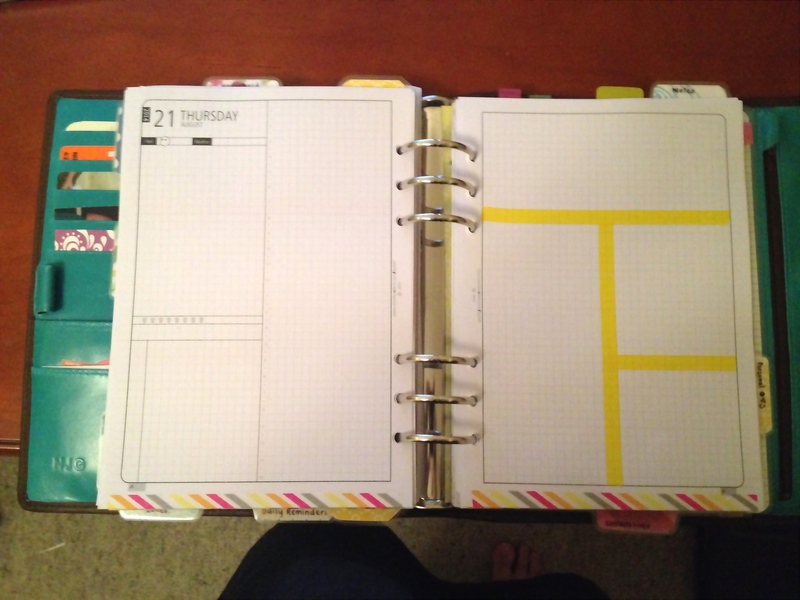 I’ll give you a closer look at how I use those daily pages this week when I write my DO2P post – so stay tuned! Subscribe to the blog to make sure you don’t miss out, or like The Peaceful Parent Facebook Page to get updated when there’s a new post. 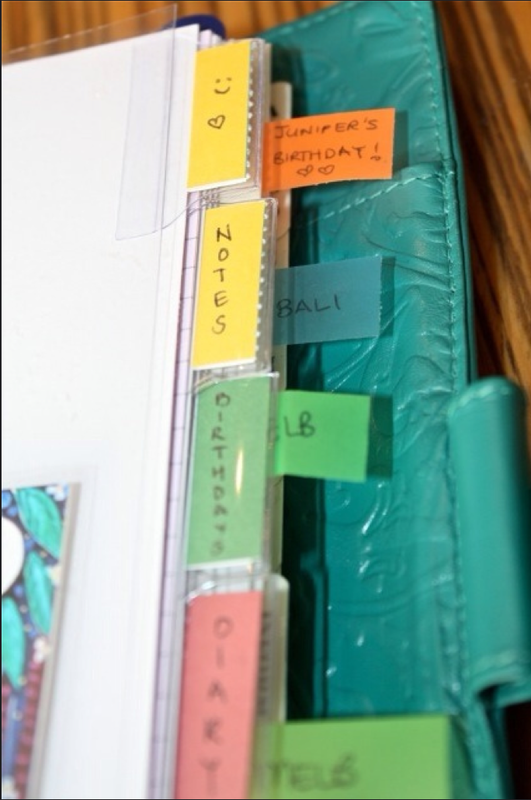 If you read my post “How to Use a Planner to Get Organised” then you already know that being organised takes time. Aside from the daily “visiting hours” I wrote about in that post, I also have a planning session before the start of each new week, and each new month. 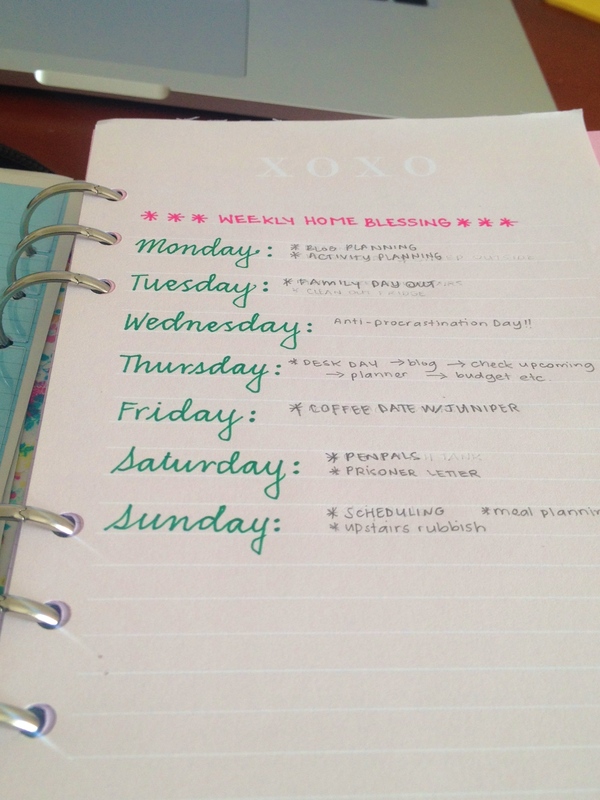 Today I’m sharing how I prepare my planner for the month ahead. My monthly planning session has 3 simple steps, some months will naturally be more complicated than others, but this process should give you a good place to start. This first step has been a huge time saver for me. 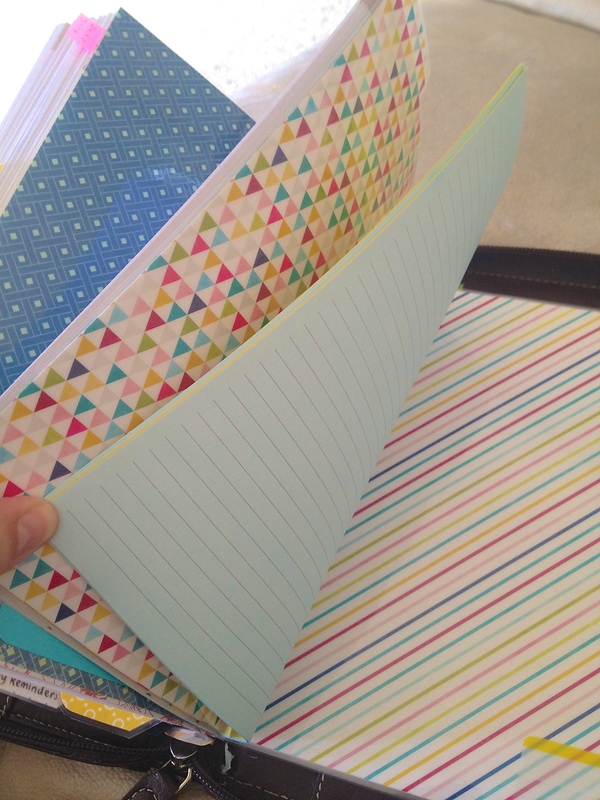 Having daily pages – or in my case, day on TWO pages, means that you have a lot of pages in your planner each month. When I was first transitioning from my week on two pages set up I found it very frustrating flipping between pages and often wasted a lot of time trying to find the right page. So, I created this system to help me easily identify each week in the month. Each weeks get a different colour so that I can more easily find any date I need. For people who have a week on 2 pages, this system could still work for differentiating between the months in your planner. You could also do it on the side edge, but I like to keep that blank so I can still use the DIYfish indexing system. 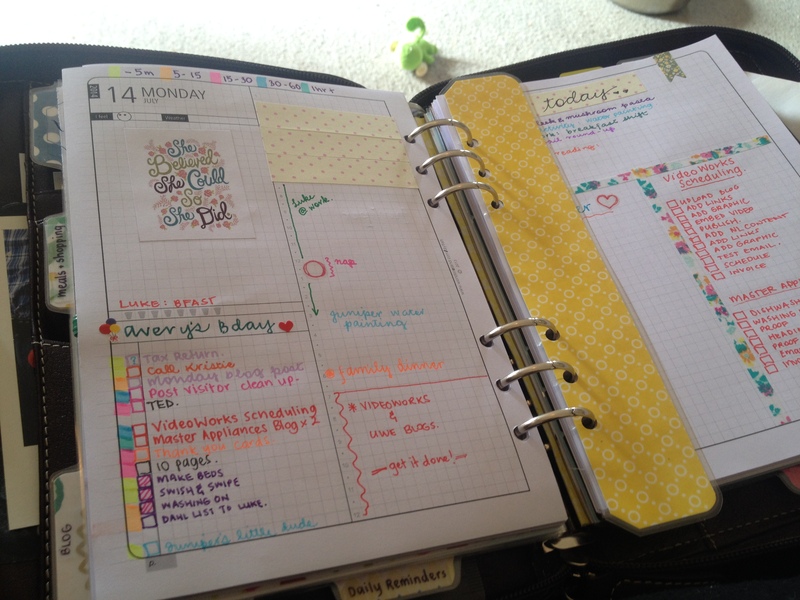 Added bonus – it makes your planner look extra pretty! One of the things I love about the DIYfish inserts is that they are so plain, which sounds like a bad thing, but it actually makes them really customisable for whatever you need. 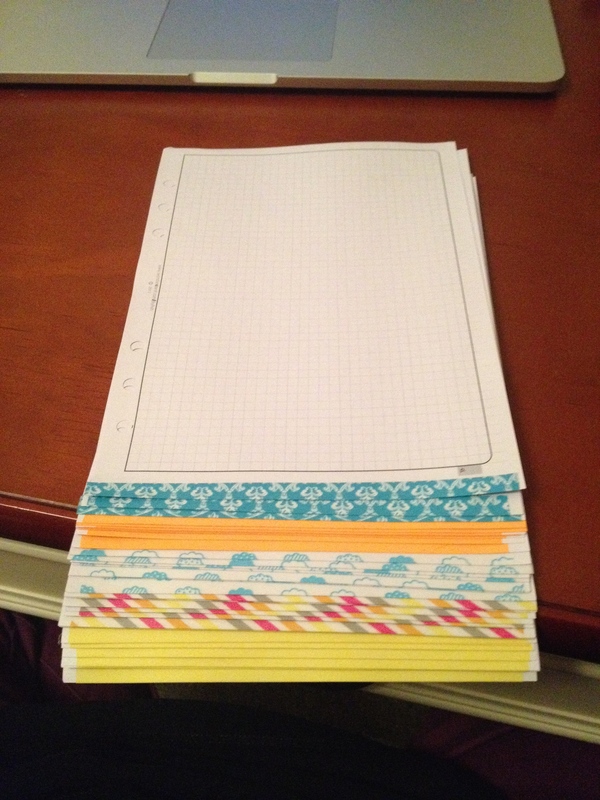 My monthly prep includes washi taping the blank second page into sections to make it more usable for what I need. 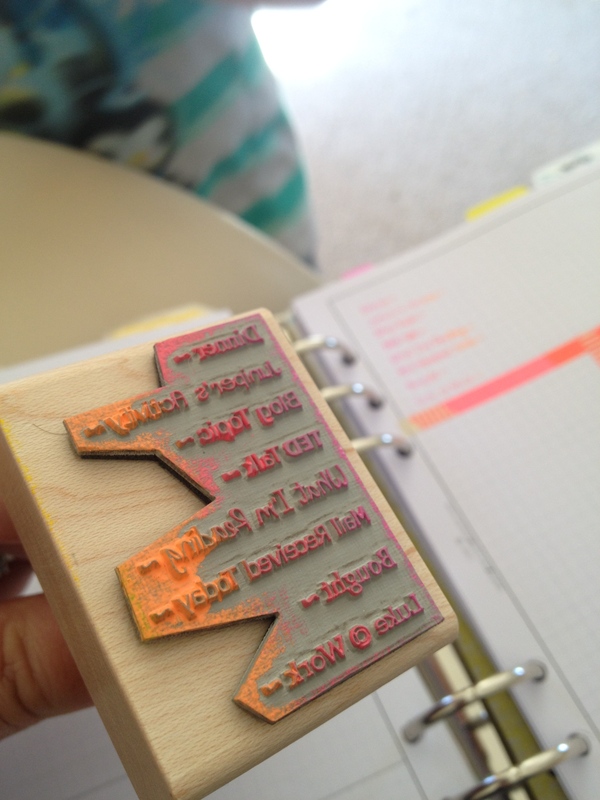 I also use a custom stamp from Etsy to put my daily tracking prompts. I also add some little motivation stickers and stuff like that. Some people like to theme out their pretty pages, but I am far too style challenged to do that! I have three places where I store information that needs to be put into my inserts at the start of each month. Monthly Inserts – I only have one month at a time of daily inserts in my planner, but I keep an entire year of monthlies in there so the monthly pages collect a lot of information as I go. Important Dates – I have a page entitled “Dates to Remember” in my planner. On that page I write anything that will need to be scheduled, but isn’t necessarily important enough to go into my Monthly page. So, appointments that need to be made, but don’t have a set day yet, or general tasks that won’t fit in the small monthly page. 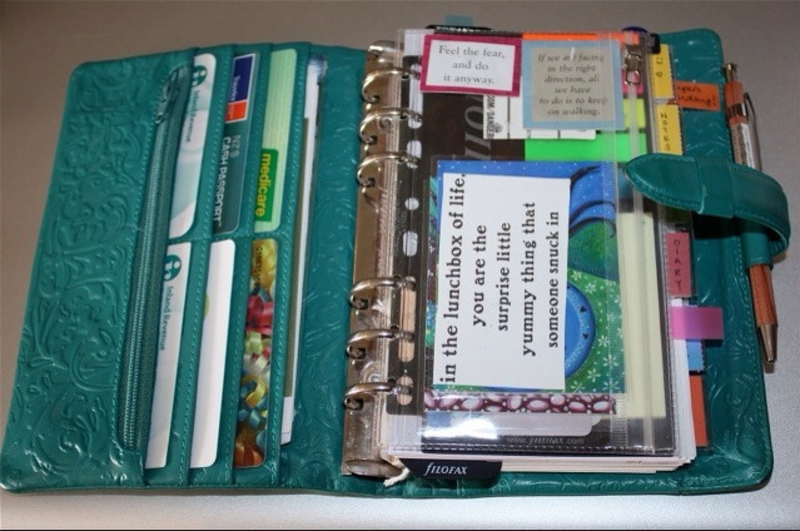 Perpetual Calendar – I keep my Erin Condren perpectual calendar in the back pocket of my planner. It has all of my important recurring dates throughout the year – birthdays & anniversaries mainly. When adding these dates to my planner, I not only put a note on the date itself, but also a reminder the week before to get a card or gift. These 3 small steps give me a great foundation for planning throughout the month. Next up I’ll show you how to use this foundation to help with weekly goal setting, priority planning and daily tracking. Make sure you follow the blog so you don’t miss out – and remember to become a fan of the Peaceful Parent Facebook Page. Here I am, as promised in my Van Der Spek Unboxing post, ready to share some ‘moving in photos’ as I transition from my old Filofax A5 Holborn and into my new lovely VDS. You’ll be happy to know that I took these photos in the light of day, so they are much better than the unboxing set! Here she is in the light of day: look at that stitching! 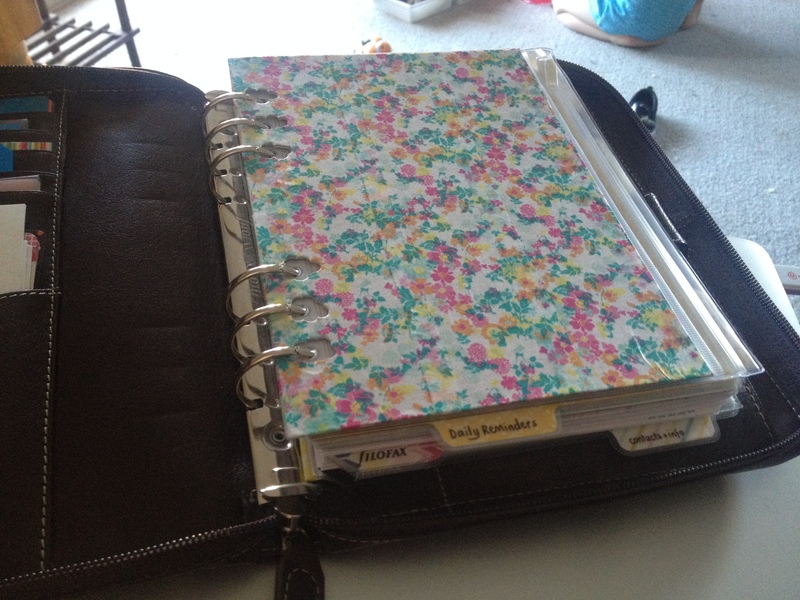 I got the binder without stiffener so it is lovely and bendy – just the way I like them! So many pockets in that front section! And they hold a lot more than I was expecting, they look so neat that I expected that would be really tight, but actually they are lovely and large and easily fit everything I need. 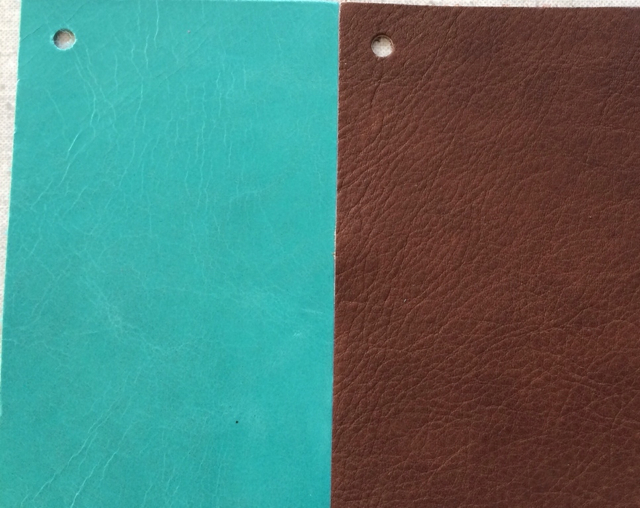 The gorgeous Personal Filofax Teal Baroque for colour reference. She sits completely flat right out of the box, without any training at all, and best of all, she still keeps the structured line of a beautiful old book. It’s such a small detail, and one most people probably don’t even think about, but the closure flap even naturally sits away from the binder so you don’t have to keep moving it out of the way to write. And check out the size of those rings! 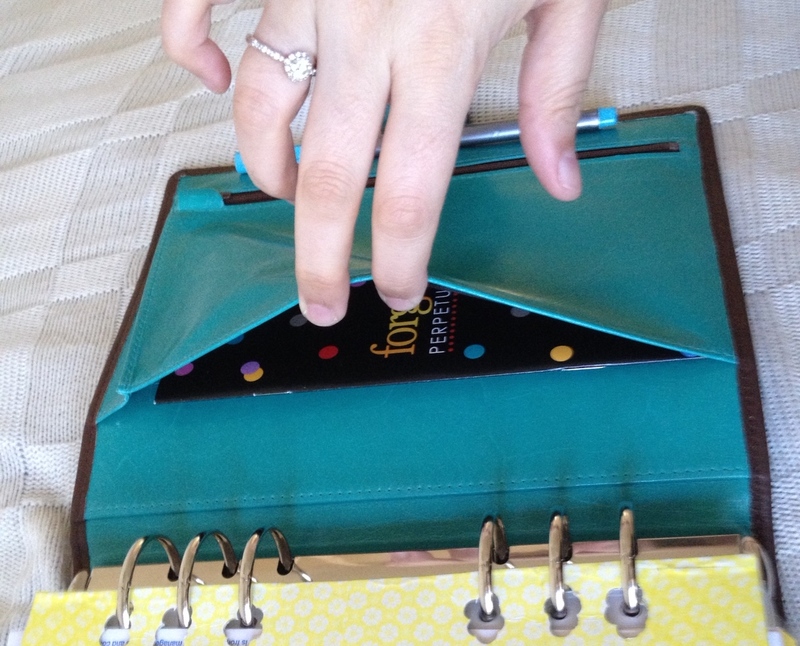 Lovely gusseted back pocket – the perfect size to fit my Erin Condren perpetual calendar! Needless to say, I’m completely in love! If you have any questions about the Van Der Spek, or about how I’m using my planner, leaving a comment below, and don’t forget to visit me on Facebook too. 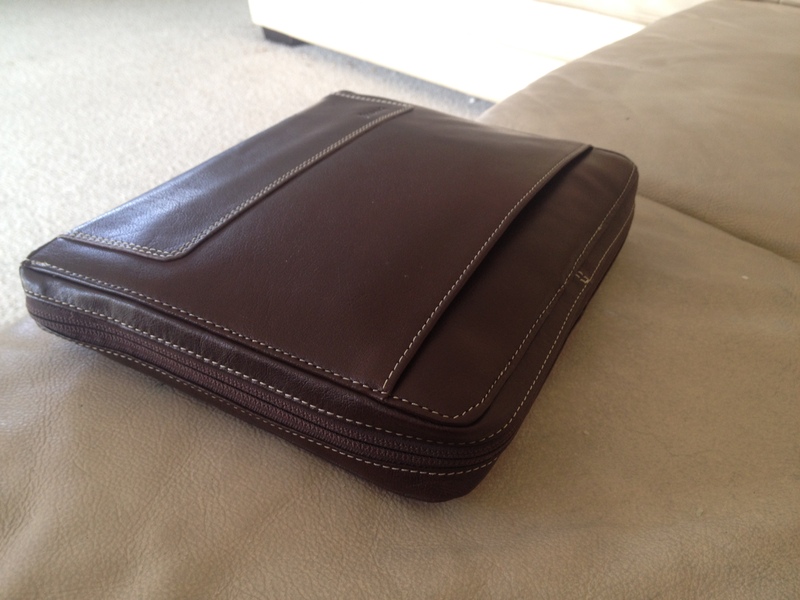 If you read my last post Breaking up with Filofax, then you’ve probably been waiting for this one – the unboxing of my new and lovely Van Der Spek binder. I apologise in advance for the bad quality of the photos, by the time we checked the mail and got home with the parcel it was already dark and there was no way I was going to wait until morning to open the box! My first impressions are – WOW! She is just as gorgeous as I imagined and the feel of the 6202 leather on the outside is even more soft and lovely than I thought it would be. The inner #19 is almost a perfect match for the teal baroque I was hoping to emulate as well which is so exciting – it’s always a bit hard to tell colours on the computer screen. I’ll do a post in a second with all my ‘moving in photos’ and I have a photo of the VDS and baroque together that I’ll include as well for reference. I’ll go and put that post together now, but while you’re waiting why not head over to facebook and like my page? See you soon! I’ve been a Filofax devotee for many years now. My first beauty was a gorgeous personal sized turquoise Baroque that stole my heart and barely left my side for 5 years. Later I fell in love with the Malden – my ochre Malden was a faithful travel companion during a disastrous international holiday (we had to part ways soon after, because of the bad memories!). When I came home I started a business, set up a home office, and decided it was time to upgrade to an A5. In early 2012 I bought a ‘testing the size for compatibility’ A5 Sketch. Once I saw that the size would work well for me I invested in a beautiful A5 Holborn zip. I fell in love with her in the flicker of my computer screen and searched high and low for a great price. She travelled halfway round the world to be with me, and when she arrived, much to my dismay, she was damaged. Her rings weren’t even close to closing! I was pretty devastated, but I’m a resourceful girl, so I went online to see if there was something I could do about the problem before I shipped her back. Instead of finding a solution to the problem I found page after page after page of people who were having the same problems as me – malfunctioning rings. And not just in the Holborn. The problems were pretty much across the board. Having a damaged Filofax was one thing, accidents happen after-all, and no brand can be perfect all the time, but this was more than that – and honestly seeing so many unhappy people made me feel something different about the brand. The thing about my Filofax was always that it was a luxury item to me. The leather, the inserts and all the little accessories that I bought to go along with it. They were a personal celebration of my financial independence as an adult woman. It sounds ridiculous, but when I jotted down business meetings or flight details or holidays, I was proclaiming my freedom and personal success. I was happy to pay the price for that feeling, even if it was sometimes more than what a regular person would spend on such an item. So the realisation that my Filofax was actually just a mass produced binder with quality control issues saddened me. I wondered if I should get a refund and find a brand to replace them. I even did a little research trying to find another company that could mean to me what Filofax had. I couldn’t find what I was looking for though, so I sent the Holborn back and got a replacement, all the while struggling with my fading loyalty to the brand I had loved so much. My new Holborn arrived, just as spectacular as I had imagined, and this time the rings closed fine. Fine, I admit, but not great. Sometimes the bottom ring doesn’t close quite right and I have to remind it of where it’s supposed to go, and sometimes my paper gets caught when I turn a page. If I’m honest, she’s never closed with the satisfying SNAP! of my previous Filos either, instead she gives a weak little *clink* and I admit that every time I have opened her – always by the mechanism, for the record – I have cringed a little at the idea that this might be the time that she doesn’t quite recover. But in spite of her weaknesses I have loved her. She has been my daily companion for 2 years and it will be hard to say goodbye. Especially since this time I’m not just saying goodbye to my Holborn but to Filofax all together. I wasn’t quite ready to give up. At least not until I found the perfect replacement, and I’m happy to say that I did. Van Der Spek wasn’t even on my radar when I did my ‘maybe breaking up with Filofax’ research 2 years ago. In fact, I discovered them by accident in June of this year while trying to find an archive system for my pages – something with REALLY BIG RINGS. From the very first image I saw, I was sold.. and the more research I did the more I knew that the Van Der Spek was just exactly what I had been looking for. Excellent customer service – Check! The more I read, the more I knew that I would never go back to a Filofax.. and so I emailed Petra. 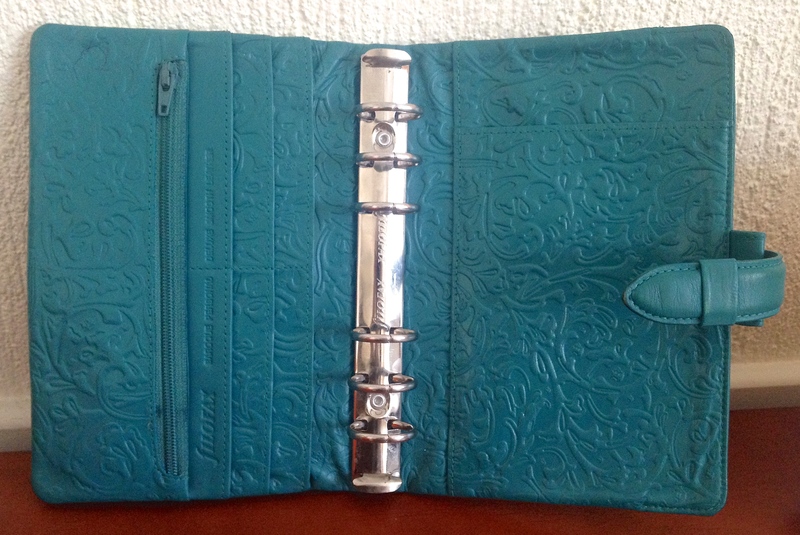 Together we created a custom beauty that would honour my two big Filofax loves. My very first turquoise baroque, and my beautiful A5 Holborn. I chose #6202 for the outside of the Van Der Spek and #19 for the inside. I added some extras too, like an additional pen loop, and my initials embossed in the leather to make her that little bit more ‘mine’. No stiffener, no contrast stitching.. order placed, invoice paid.. and then the wait began. Of course if you’re anything like me you’ll already know what that wait looked like. I watched every single Van Der Spek related YouTube video ever created, relentlessly stalked the VDS facebook page, and Google-image searched every possible combination of words to make sure I had seen every picture ever posted of a VDS planner online. Obsessive is my middle name. The good news is that she arrived today. My new beautiful planner is here and she is gorgeous. 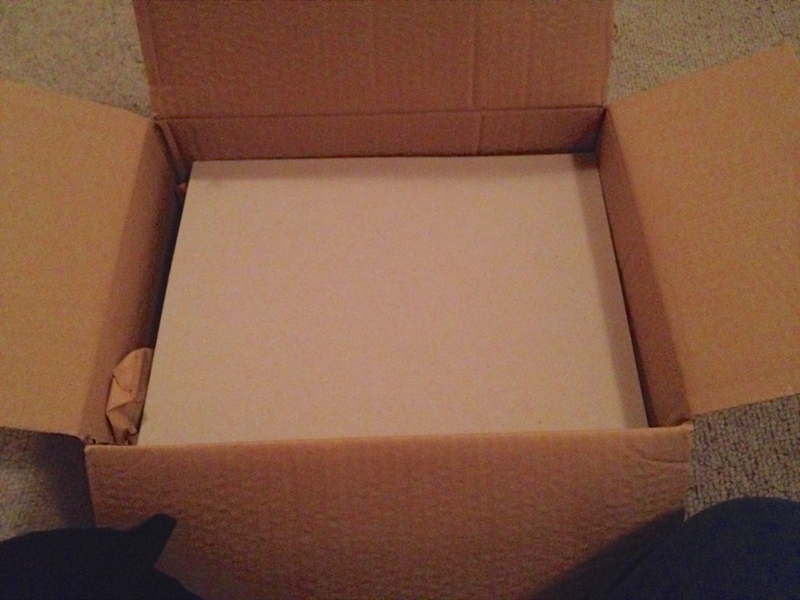 But today isn’t the day to say hello to the new, this post is for saying goodbye to the old. You have been a big part of my life Filofax. Thanks for everything. 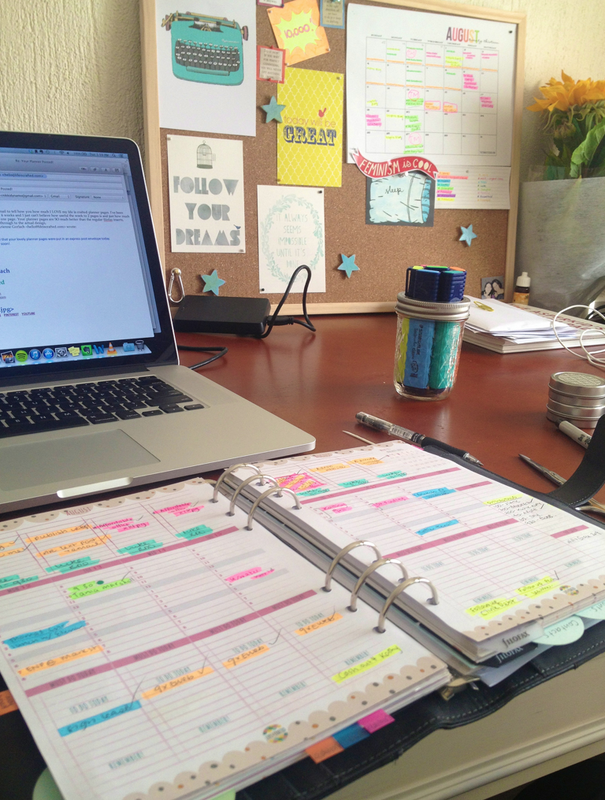 Here’s a secret about being organised: it takes effort! You probably won’t find your ideal planner or inserts your first time out of the gate, and that’s okay, because the biggest tip I can give you for staying organised is not about inserts or tabs or stickers. 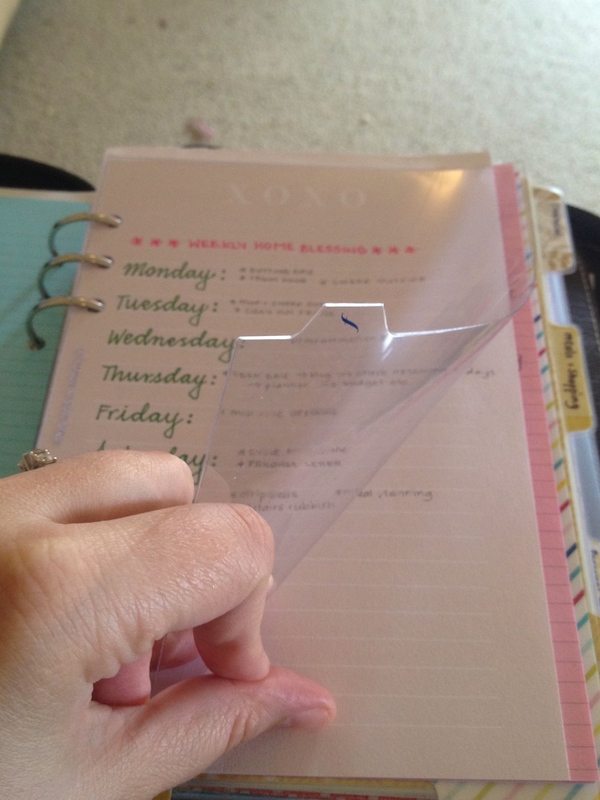 to actually use your planner. 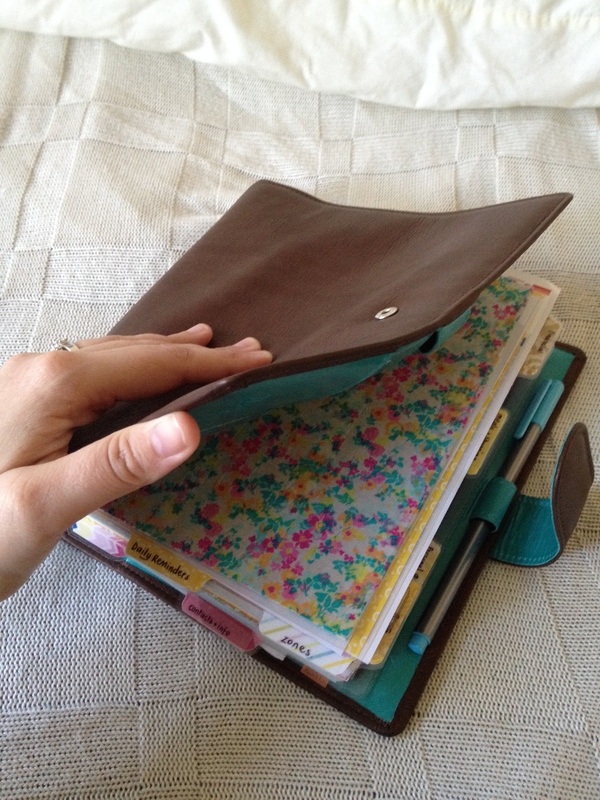 It’s not enough to buy one – having an organiser will not make you organised. 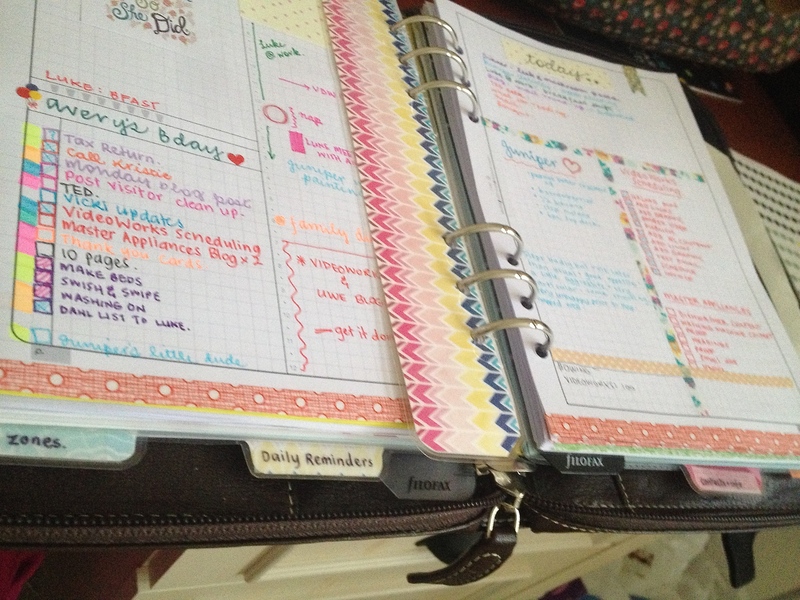 It’s not enough to decorate the pages – pretty pages will not make you productive. And that’s where your planner comes in. First things first I write everything down.. and I mean everything. If I see an ad for something I think I might like to buy, I write it on my wishlist, if I decide that Juniper is not eating enough spinach I’ll write it in my meal planning section, if I get a notice about a rental inspection it goes into my planner before I even put the notice down. 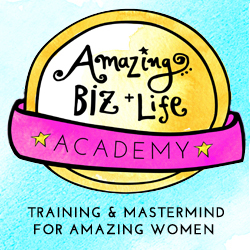 One of my big planning AHA moments was realising that my brain alone could not be trusted! My planner is an A5 binder. It’s quite large and not all that portable, so it spends most of the time sitting open on my desk. I visit my planner at least 3 times every day to make sure I know what’s coming up, and to ensure that the day is going according to plan. 7AM: First thing in the morning as part of my morning routine, I take a glance at the day and remind myself of what’s ahead. 10PM: At the end of the day, in the last half hour before bed, I go through and make sure I have accomplished everything I had planned for the day. I reschedule anything that wasn’t achieved. It is also open beside me on my desk whenever I am working through my freelance projects, or paying bills or meal planning, or any of the other million things I do at my desk.. out of sight is out of mind so I keep her in plain sight as much as possible. Ideally, you need to be able to see at a glance what is already done and what still needs attention. As you can see, items are also colour coded for the person it relates to and the type of activity it is, as well as for how long it will take to complete. So, if I know I have a spare 15 minutes I can quickly see what can be achieved in that time frame. I have that time coding reference on the top of each insert page for quick reference. You can see that, as well as the time coded to-do list in action below. In addition to my daily filofax visiting hours, I have time scheduled on Sundays to go through and do a weekly review and to plan the week ahead.. but that’s a post for another time! Subscribe to the blog to make sure you don’t miss out. Way back when I did my TABS post I promised that I would give you a closer look at my Daily Reminders Tab, so here I am (better late than never right?). The tab itself is probably a bit mislabeled because there is weekly reminder stuff in here as well – oh well! 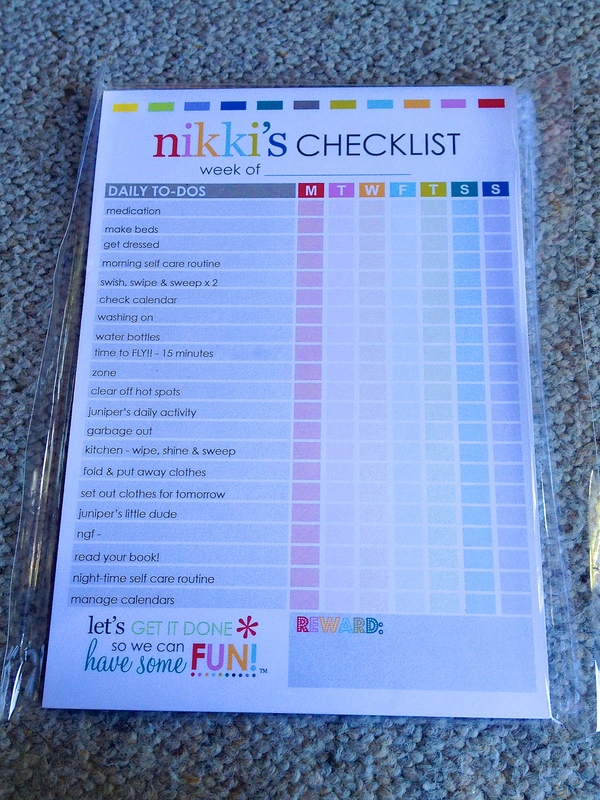 First off I have my Erin Condren custom A5 FUNctional family checklist. The checklist came in a pad of 25, which will be a 6 month supply. 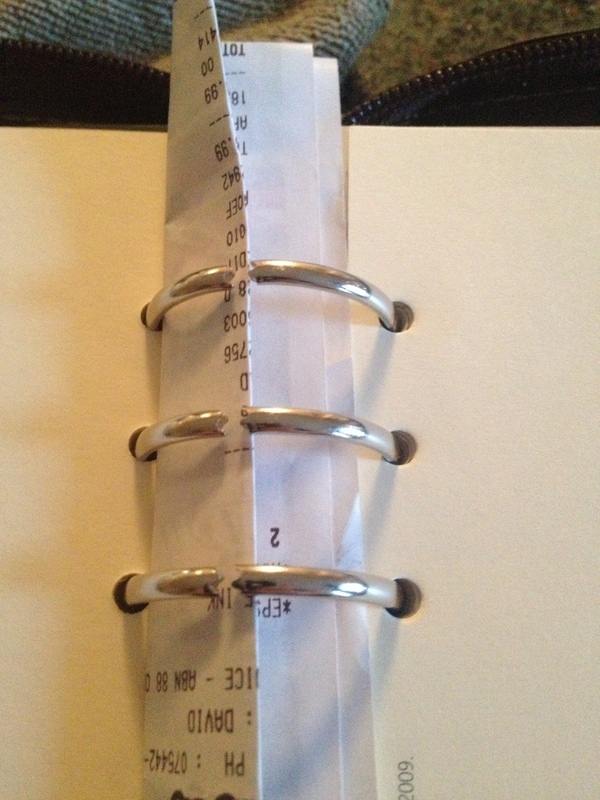 I hole-punch a new sheet at the start each week and add it into my Filofax. The list includes my flylady daily tasks, personal tasks, business tasks and some family related tasks as well. It’s not a comprehensive look at what I do each day, but it helps me get on track if I get distracted during the day. Next is my daily tracking page. This serves as a reminder of each of the things I want to record each day. I keep a record of these things on my DIYfish Do2P layout. Most of them appear in my TODAY section at the top of the page on the right. This isn’t a very clear picture but it will help you see what I mean. 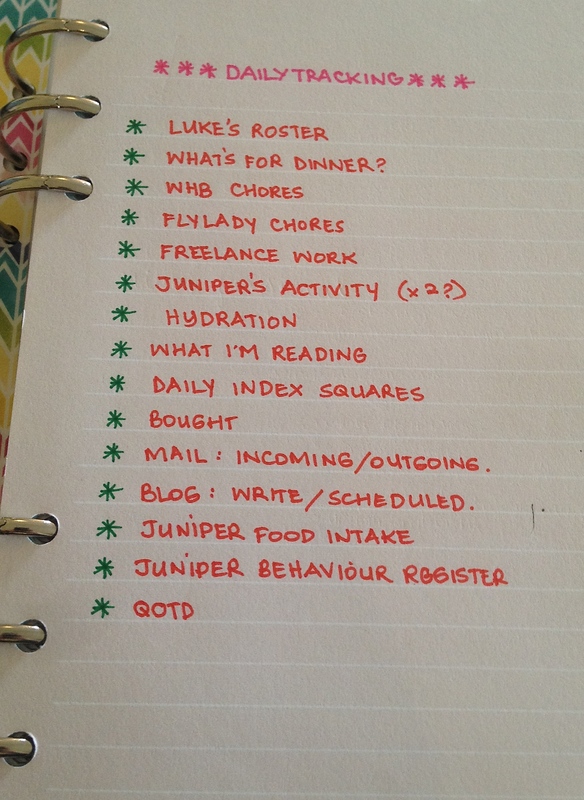 The blue column on the right page is my food/behaviour tracking for Juniper. 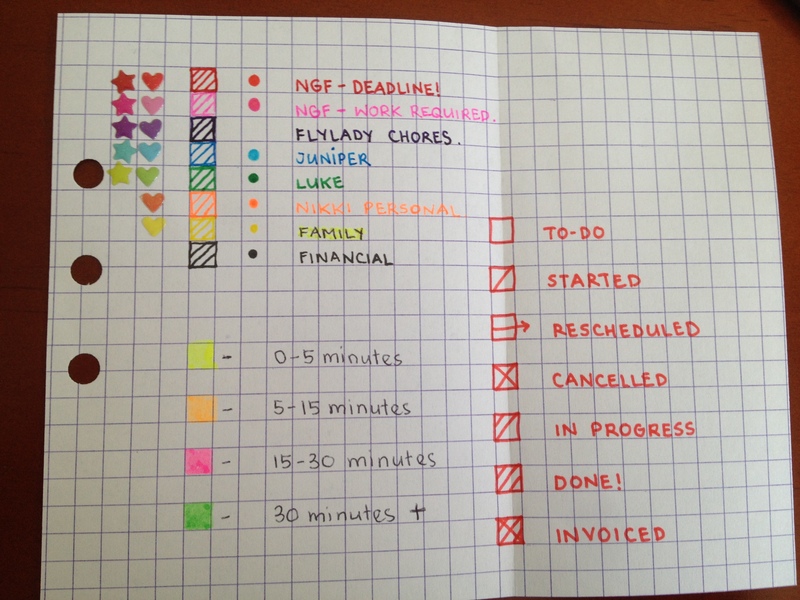 The column in red is my business related to-dos for each day. In my daily reminders section I also have a handwritten collection of some of my favourite motivational quotes to keep me motivated if I need it. And I have a list of the Flylady 11 commandments. Finally, I have a list of weekly reminders. Which I cover with a clear flyleaf page. I mark off items directly on the flyleaf with a whiteboard marker so I can just wipe it clean at the end of the week and I don’t have to worry about rewriting the list. Overall this system has been working really well for me, particularly in conjunction with my flylady ZONES tab set-up. If you’d like to take a closer look at any of my other sections, leave a comment and I’ll do another post.